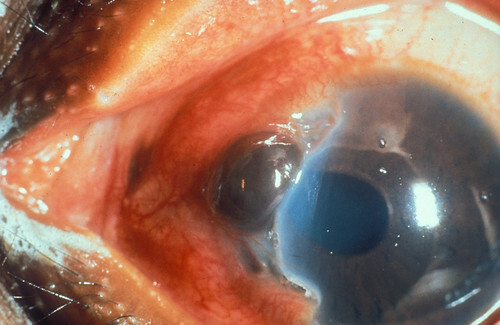 This penetrating eye injury has occurred at the nasal limbus of the right eye, a common location for a rupture. The iris has prolapsed and the pupil is distorted. The wound may also extend backwards along the globe. © International Centre for Eye Health www.iceh.org.uk, London School of Hygiene & Tropical Medicine.